I've got another card for you using a stamp set from The Alley Way Stamps. They have a great new set, Ghoul-Friend which I used to make this card. I had to cut the sentiment to fit across my banner, I was a bit nervous I must admit, but it worked out great! I am going to put this card in the CAS-ual Fridays Challenge, the Dynamic Duos Challenge and the Catered Crop - use a knot. Thanks for spending some of your time viewing my blog! Excellent card Tracy, that ribbon is so perfect for your mommy card! Goul Friend? Ahahahaha - this is wonderful. Thanks for the smiles this morning! I also like your embossed background and that fabulous ribbon! Charming in so many ways! 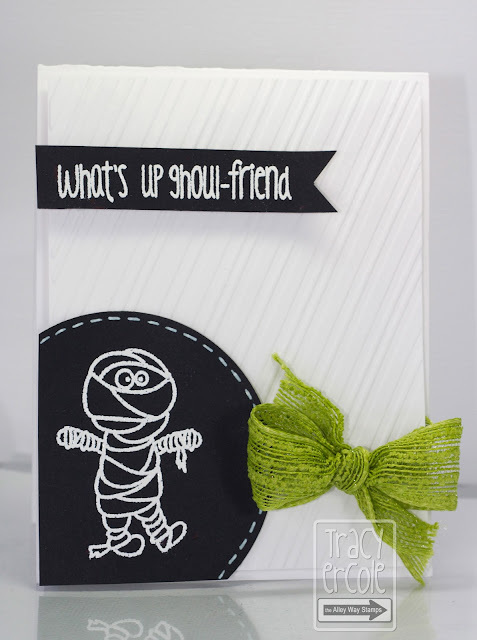 I like the creative touch of the "rays" on the embossing folder focusing right at the mummy!! 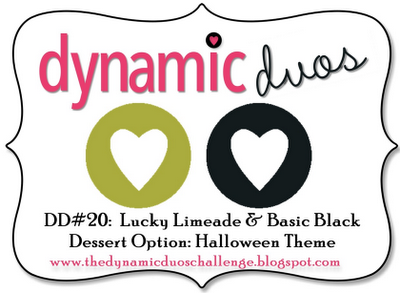 So glad to see you at Dynamic Duos!! What a fabulous card! I love that green bow! Thanks for playing along this week at CAS-ual Fridays! Awesome awesome card. Love how the embossing adds so much texture to the card! Thanks so much for playing with us at CAS-ual Fridays! I just LOVE that adorable mummy and green ribbon...awesome!!! Thanks for joining us at Dynamic Duos!